The AIM NetworkEnvironmentFire: what have we learned from the devastation? Fire: what have we learned from the devastation? Some of the lessons learned from decades of studying major fires have been learned, and then forgotten, in a drive to simplify the message to the public, writes Graham Parton. Every major Australian bushfire is inevitably followed by an enquiry into what went wrong and an attempt to find out how future disasters could be avoided. Among the most notable bushfires of the last fifty years has been the Tasmanian “Black Tuesday” fire of February 1967, which at the time was the single most significant loss of life and property ever experienced in post settlement Australia. The official Government enquiry into the disaster closely examined the causes of death, and noted that in about half of the cases where people died close to their home, their homes did not catch fire. The Chambers and Brettingham-Moore report concluded that “In a few cases it may be said that if they had stayed inside they would have had a reasonable chance of survival’. Alan McArther and Phil Cheney from the CSIRO’s Forest Research Institute also reported on the Tasmanian fire and noted the large number of people who were unable to either get away from the fire, or to defend themselves when it arrived. Their report was among the first to explicitly suggest that staying and defending property could be preferable to a last minute evacuation and it was their research that planted the seeds for the subsequent policy of “prepare, stay and defend or leave early”, sometimes abbreviated to the “stay or go” policy. This approach gains some support from more research that followed the Tasmanian fire. 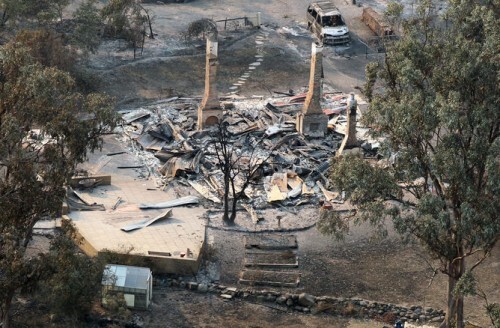 Katharine Haynes, Amalia Tibbits and Thomas Lowe, writing in the insurance industries Quarterly Newsletter examined what people where doing immediately before their deaths in the Tasmanian fire and confirmed the official findings that both defending property from outside and late evacuations were the main cases of death. As an aside they also found that the people killed defending were almost exclusively male, and the people killed in late evacuations were almost exclusively female. The main message, reinforced in social media and on television is the same; if in doubt – leave early. Television images of smoke on the distant horizon while families consider whether or not it is serious enough to evacuate are now routine and lead the viewer to the conclusion that early evacuation is the only sensible option. The CFA web site contains some details about how to defend your property but the banner headline over this advice is “Defending your home is risky – you could be seriously injured, suffer psychological trauma or die. The safest option is to be well away from the threat.” Further down the same page is the message “Defending your home is extremely hard work and requires significant resources. It may take hours and sometimes days of extreme effort”. Once again the steering towards the early evacuation option is less than subtle. Added to this are the additional problems caused by too many people leaving at once and the risk of traffic jams and accidents, any of which could make the act of evacuating more dangerous. Professor Drew Dawson has conducted research into human behaviour and planning around fires notes that planning to leave early doesn’t mean you don’t also need a plan to stay and defend. “Leaving early is ok, but not once you’ve seen smoke. Simplistic solutions very attractive to policy makers but they are not the best solutions.” He noted that homeowners need a set of plans for different scenarios. He reinforced the conclusion reached by the recent Victorian Royal Commission into the 2009 “Black Saturday” fires that there is no “one size fits all” model for evacuations. The problem is that fires are complicated, planning for them is complicated, and the Government doesn’t want complicated emergency messages. The complications come from the number of variables that impact on fire behaviour and the general ignorance across the community about what these are. Basic precautions like removing fuel from near houses and having adequate sprinkler systems, fire pumps and protective clothing is usually sufficient for low level and local fires – exactly the ones that most fire brigades can be expected to respond to. However conditions like those that preceded all of our major fires (high temperatures for many days before the fires, high fuel loads, strong winds, low humidity) can cause large fast moving fires that make an otherwise defendable house a much greater risk. Homeowners planning on defending their homes need to understand this, plus the more specific details about their own property and how factors like fuel types, slope, vegetation, or prevailing winds are going to affect their own fire. It’s hardly surprising that emergency services prefer the much simpler option of just leaving. Another essential ingredient in fire protection is community involvement. The overwhelming message from the fire authorities is that planning should not only be focused on how early to leave, but that it be done at a family / household level, rather than a street or neighbourhood level. The result is hundreds of uncoordinated plans about how to respond to a fire. When Mum and Dad pack the children and pets into the car and head off, they are not expected to consider what the family next door is doing, and while one family might not feel safe enough to defend their house, three families might be much better able to defend three houses by pooling their resources. “People don’t know the fire environment or fire behaviour. They don’t know the scenarios they might encounter, where the fire might come from, how it will behave. They often don’t even know the rudimentary stuff like where the nearest safer place is. From his experience working in Victorian rural communities Nic Gellie believes that years ago landowners had a much greater knowledge about their properties. While much of this knowledge is lost, an opportunity to replace it with knowledge shared on social networks is not being pursued and it is a dangerous gap. Nic Gellie believes that social networks are the key to communities being better organised and prepared. The Victorian CFA supports the “community fireguard” program but Nic Gellie is concerned that compared to other firefighting activities this is underfunded. Local fire brigades tend not to have much to do with community fireguard programs and there is no real attempt to educate communities about fire behaviour. Drew Dawson agrees and notes that the emergency services model needs to be updated. The community needs to see its self as part of the fire fighting effort, not the “we are going to be rescued” model. Local brigades need to be more involved in preparations. Some technical solutions are complex too. When asked about the practice of sending text messages to people in fire affected areas he noted that the information is not always accurate, and if people get too many false alarms they may start ignoring the messages. It’s also not simply a matter of the community learning from fire experts – sometimes the knowledge exchange is a two way street. People who live in Victoria’s ash ranges have developed special words and phrases for the extreme fire behaviour they have witnessed. But many fire scholars and professionals forgot the force of fire in tall, wet forests and began to doubt what people said they saw in 1851 or 1926 or 1939 or 1983. According to this view the unrehearsed narratives of survivors were actually exaggerated fictions or ‘myths’ that needed to be dispelled by calm professional education, fire science and ‘the laws of physics’. As recently as 2008 thoughtful fire officers – drawing on the science of grassfires! – argued that there were no such phenomena as ‘exploding houses’ or ‘firestorms’ or ‘fireballs’, and that these were just the delirious words of people unfamiliar with fire. And they suggested that such untutored and emotive words also falsely implied that ‘bushfire is something beyond human control’. Nothing shows the psychological blinkers of the Stay or Go policy more powerfully than this professional disparagement of eyewitness accounts of fire in a distinctive forest. Dugouts and ‘fireballs’ were material and verbal evidence of local cultural adaptation, and yet both were abandoned and disparaged by authorities seeking universal solutions and national policies. Now more than ever before we face an increasing risk caused by longer hotter summers, an increasing population in rural areas and urban fringes, and an ageing volunteer cohort joining fire brigades. At the same time we have a new network of social connections and an increasing number of people connected to social media that could increase our awareness of how to respond as communities to fires. Thanks for this. At Honest HIstory honesthistory.net.au we have collected a long list of factors that are said to have shaped us as Australians, fire being one of them. Along with flood, drought, depression, war, mining, immigration etc. We’ll add this piece to the cache! Thank you for your article. I recently sought out information about what to do in case of a fire as I was asked to officiate at a wedding which was to be held in an extremely fire prone area in mid February. Apart from 1. not entering the area if a fire had already broken out within a 10 km radius, and 2. staying inside the building until the fire had passed, I had no other information available on what to do. I had to hope that if a fire did break out there would be enough able people present to help fight the fire. I sought information from the CFA web site and also rang and spoke to someone from the CFA, but still felt inadequately prepared. I am so thankful that January was cooler than usual, and that rain fell in the short interval before the wedding, so it was all over safely. Some of the people present may have been able to help fight any fire, but many of the guests were either from overseas, or city people who had never had to confront fire before in their lives. Quite frankly, I would have appreciated lots more information earlier, so that I would have slept much better in the lead up to the wedding. Am I a born “worrier”? Perhaps, but I have strong memories from living in Tasmania in 1967, and visiting areas affected by the fires both immediately before and shortly after. Extinguishing bushfires makes subsequent fires worse. The destructive megafires that we see today are of our own making. If there is something in nature to burn, nature will burn it so, let it. Low intensity irregular fires if left to burn will remove surplus fuel and leave natural habitats habitable. In the whole history of our continent, only the last century has seen a full out assault on bushfires. Adopting a let it burn policy will make protecting assets far less dangerous.